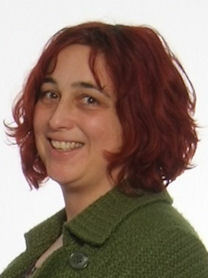 Sarah Eblett is our Home Link Support Worker. Her role at St. Jude's focuses on our partnership with parents. Her presence on the playground on Tuesday, Wednesday and Friday afternoons provides parents with a point of contact and a bridge between home and school. Sarah can be easily approached for information or advice, updating parents on school news, activities and events that take place in school and the local vicinity. Sarah produces a monthly newsletter 'Your Voice' for all parents providing useful information on services that are available to them. Coffee afternoons with Mr Tipping are held on the first Thursday of the month, enabling parents to drop in and have a chat; raise concerns, offer ideas or be co-opted to a committee! The coffee afternoon provides a platform for planning events in school, such as the successful Christmas Fair and Stay and Play initiative. Following requests made by parents this year, a variety of cooking and craft workshops have taken place, providing an enjoyable opportunity for parents and children to work together in school. 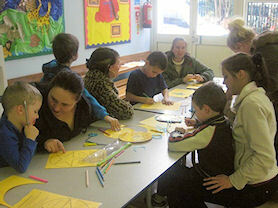 The children really enjoyed their parents supporting them in a Healthy Lifestyles workshop. A variety of workshops frequently take place at St. Jude's. These vary from parents' only workshops where we offer a range of support and advice on subjects ranging from Keeping Safe, Safe use of the Internet, Healthy Eating, Job Search and Training Opportunities to Debt Advice. In addition to these, curricular workshops with the children are an ever growing part of school life. Our parents enjoy the opportunity to come into school and work with their child. What a great way to find out how you can continue to support your child at home. During the course of the year, we undertake a number of fact-finding activities with our pupils and parents. Our children are very used to us having a 'chat' with senior members of staff to find out what they think of provision in school and how we can make it better. The process of pupil discussions is one of our formal monitoring opportunities in school; pupil voice is very important to us. To this end, we operate a very successful School Council. This active group meet regularly each month, under the direction of Mrs Orton our Learning Mentor, and report to the Senior Leadership on their ideas. Our parents' opinions are equally as important to us. Whenever we invite parents into school we are used to evaluating their response to an event. Any suggested improvements are seriously considered and acted upon where appropriate. We regularly seek parental views via questionnaires and parents are strongly encouraged to complete the Ofsted online survey Parent View. "I would like to say that making the decision to send my child to St Jude’s has been one of the best I have ever made." "Thank you to all the staff for all their hard work throughout the academic year helping my son. It is much appreciated and does not go unnoticed". "I believe St Jude’s is a wonderful school. My child really enjoys it here, the teachers are all fantastic."